Google was incorporated as a company on Sept. 4, 1998. Later in that same month the search engine went live to the public, and oh how it was a different beast than the site we all rely on today. Easter eggs are not an uncommon thing on Google. (One of my favorites is searching for the word “askew,” give it a try) The newest one will wash over old school Internet denizens with a sense of nostalgia. 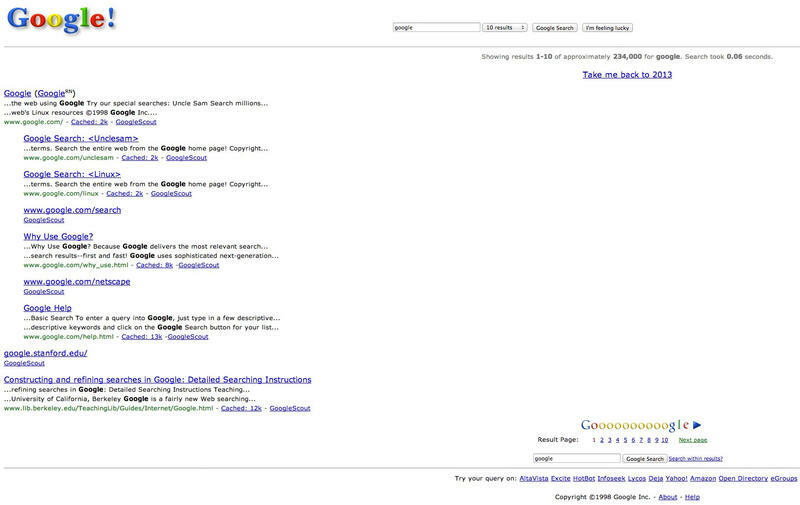 Search for “Google in 1998” and you’ll be treated to a throwback to how the site looked low those many 15 years ago. I think one of my favorite things about this is I had forgotten that back in the Day Google provided links to other search engines. If you look down at the bottom of the page you’ll find links to trying your query on AltaVista, Excite, HotBot, Infoseek, Lycos, Deja, Yahoo, Amazon, Open Directory, and eGroups. All of the links take you to a corresponding snapshot of those sites on the Wayback Machine, which is fitting since most of those sites are no longer in existence since Google crushed them. It’s a fun little trip down memory lane for those who were around back then, and a view into what the Internet was like back in those heady days for those who weren’t.